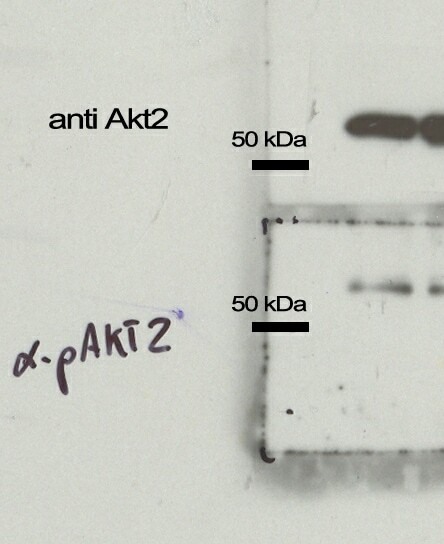 Akt2 (phospho-Ser474) antibody detects endogenous levels of Akt2 only when phosphorylated at serine 474. 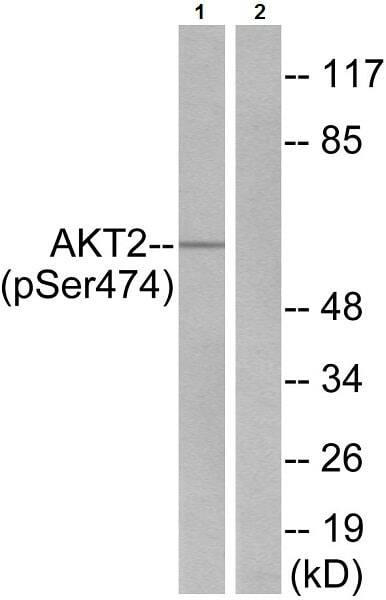 The region of AKT2 surrounding S474 has a high degree of similarity to the corresponding regions in AKT1 and AKT3 and thus may cross react with these proteins if phosphorylated on the corresponding serine residue. Synthetic peptide within Human AKT2 aa 432-481 (C terminal) (phospho S474). The exact sequence is proprietary. 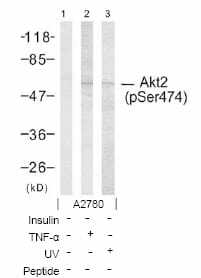 The antiserum was produced against synthesized phosphopeptide derived from human Akt2 around the phosphorylation site of serine 474. Lung carcinoma tissue slides, A2780 cell extract and EGF treated 293 cell lysate. Our Abpromise guarantee covers the use of ab38513 in the following tested applications. 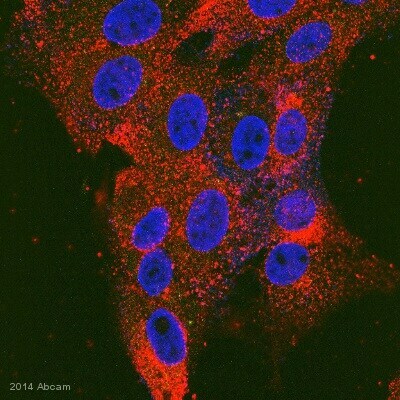 ab38513 staining AKT2 (phospho S474) in 293T cells by ICC/IF (Immunocytochemistry/immunofluorescence). Cells were fixed with formaldehyde, permeabilized with 0.1% Tween and blocked with 3% BSA for 1 hour at room temperature. Samples were incubated with primary antibody (1/20 in PBS + 3% BSA) for 2 hours. 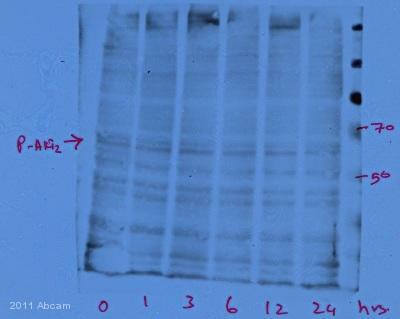 An Alexa Fluor® 555-conjugated donkey anti-rabbit IgG polyclonal (1/500) was used as the secondary antibody. Lane 1 : Extract of A2780 cells. Lane 2 : Extract of A2780 cells + TNF alpha. Lane 3 : Extract of A2780 cells + UV. Lanes can be loaded with 5-30µg of total protein. 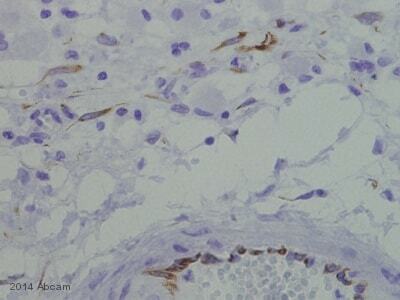 This image shows human lung carcinoma tissue stained with ab38513 at 1/50 dilution. Image on right: treated with phosphopeptide at 1µg/ml (negative control). ab38513 staining AKT2 in human infantile fibromatosis tissue sections by Immunohistochemistry (IHC-P - paraformaldehyde-fixed, paraffin-embedded sections). Tissue was fixed with formaldehyde and blocked with 1% FBS/BSA for 3 hours at room temperature; antigen retrieval was by heat mediation in Tris pH 9. Samples were incubated with primary antibody (1/150 in TBS + 1% BSA + 1% FBS) for 16 hours. An undiluted HRP-conjugated goat anti-rabbit IgG polyclonal was used as the secondary antibody. Publishing research using ab38513? Please let us know so that we can cite the reference in this datasheet.